and was keen to discover more about Elle Hollis and her latest track, Luxury. 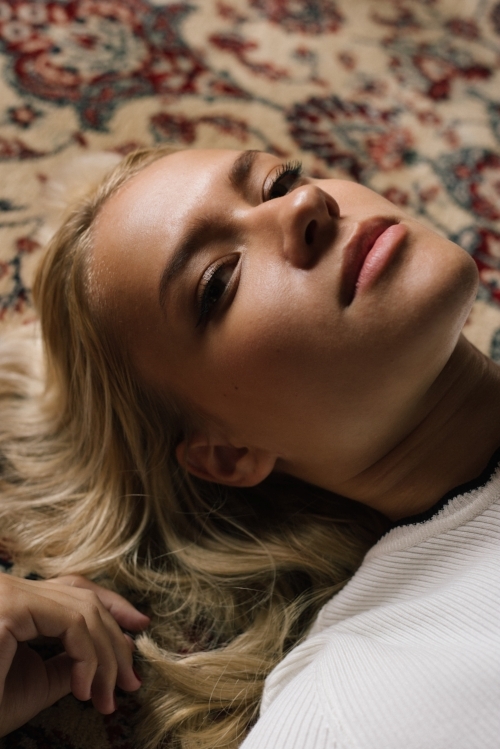 The Netherlands-based artist tells me more about its background and what we might expect from her going forward – she also reveals a rising artist we need to keep an eye out for. I ask which artists and albums have played a big part in her life and how important it is getting onto the stage; if she gets chance to unwind away from music and if there are tour dates coming up – she ends the interview by picking a great song. Hi, Elle. How are you? How has your week been? Hi! My week’s been pretty chill so far. I have a performance tonight which I’m really excited about. So. I’m Elle Hollis; twenty-two-years-old from the Netherlands. I’ve been singing and making music for as long as I can remember. But, I didn’t grow up in an area where a lot of people did that or something else that was creative. I was never the odd one out but, deep down, I always wanted something different than my peers; always wanting something more, something creative. I eventually went to Stockholm to work on music and after that I got my first publishing deal at Warner/Chappell. Since then, I’ve been writing and creating so much and I love it. My music is a mix between Pop/Electronic with fresh vibes. Luxury is your new single. Can you reveal the story behind it? I made Luxury with producer duo QSTNMRKS. We initially wanted to make something in the style of Finesse by Bruno Mars because we were really digging that vibe at the moment. So, I wrote the lyrics and we recorded a first version which was still very upbeat. And then the next day we thought ‘No, this just doesn’t feel right’. It’s not the feeling we want to convey with this. And then we changed the production to what it is now and it all just made sense. The song is about the feeling of only being able to express the feelings you have for someone when you’re under the influence of something, like alcohol. And even though it can be very fun to just be reckless and impulsive for a moment, it’s also very sad because those feelings are still there when you’re sober. So, combining that with a darker and more serious production gives us Luxury as we know it now. Might we see more material arriving next year? Yes. I have so many songs ready to be released! I really just can’t wait for everybody to hear them. As I said; I didn’t grow up in an area where people were very creative or made lots of music. No one in my family sings or makes music. My parents have always really appreciated music though and are always interested in the stories behind songs or albums. But, besides that, I really did it all myself. You are based in the Netherlands. What is the music scene like there at the moment? Right now, Hip-Hop/Rap is pretty big in the Netherlands. Dutch music really fills up the charts. But, the Dutch charts are not really my priority. I’ve always been really interested in the Scandinavian music industry for instance. And I’d rather not be ‘famous in a commercial way’ but still have sold-out shows and fans who appreciate your music because they genuinely like it, even though it’s not big on the radio. In 2019, I’m gonna release a lot of music and perform! I love performing, so I want to do that as much as possible. My best memories in music include a performance I did in Luxembourg. I was the opening act for Louane, a French singer, and it was a sold out show with about 3000 people in the audience. I loved it. The bigger the audience the better I feel when I’m performing. And my other best memories are studio sessions with people that you really connect with on a musical level. Since I’m not used that where I grew up, it always feels really special. Three favourite albums, O.M.G. I have so many! But, I guess the ones that hit a part of me I feel no one else gets is Where the Light Is by John Mayer (the live album); Nothing Was the Same and Take Care by Drake and Blue Neighbourhood by Troye Sivan. And everything that Billie Eilish makes. That’s more than three, I know. But, these albums really came out at times when I apparently really needed them. They really inspired me in terms of songwriting and composing. If I could ask for any kind of present for Christmas, it would be the ability to travel anywhere as much as possible. My more realistic wish is a snowboard or a skateboard. If I could support any musician right now, I would pick Troye Sivan. I absolutely love his latest album. Let’s hope it’ll happen some day! If I could give any new artists advice, it would be to really not care about what people think of you being creative and making music or whatever it is you do to express yourself. I literally have to tell myself this every single day as well. Haha. But, it’s so true. In the end, it’s all about making yourself proud. I have some shows planned in the Netherlands in 2019, but I also really wanna go abroad! I would love to perform in the U.K.! (so please book me if you want to see me. Haha). Being on stage is one of the most important things for me. When you have a good show and the audience is really into it, it just gives you so much energy. I really want to be an artist that doesn’t just have fun songs but that really puts on a great show that people will always remember. I think some people still haven’t found out about Billie Eilish. Her songwriting is amazing and she’s only sixteen. That’s insane. I wish I was that confident at sixteen. Haha. Maybe her music is a bit too alternative for most people but I still think she’s gonna be huge. When I’ve been working on music a lot, I sometimes really need to chill away from it. I can never really completely chill away from it since it goes on in my head 24/7. But, watching movies, T.V. series and hanging out with friends really helps. That also gives me time to get new inspiration. Let’s play Lost by Frank Ocean. I love that song - always makes me feel good!